When a book boasts the monumental declaration, The Best American Noir of the Century, it damn well better stand up to scrutiny—all prodigious 752 pages of it. And so it was with relish that I tucked into this meaty and bloody feast from arguably the finest literary writers of noir America has ever produced, hoping for some tasty morsels. The Best American Noir of the Century is a colossal collection of 39 short stories dating from as far back as 1923, right up to 2007, and selected by James Ellroy and Otto Penzler, neither of whom need an introduction to any noir/crime aficionado. They are all there in this anthology, the greats synonymous with noir: James M. Cain to James Lee Burke, alongside Dorothy B. Hughes and Joyce Carol Oates—each giving us their different web-like spin on the dark worlds they weave so proficiently. And that’s noir in a nutshell: flawed souls and sure things going bad, usually in the shape of a PI spinning too many plates for his own good, or a hard-working detective keeping his cards too close to his chest and ending up bad. Surprisingly though, The Best American Noir of the Century has few if any PIs and detectives gracing the pages. Penzler gives reasoning, of sorts, behind this salient omission by drawing a clear line in his definition of noir, explaining in the foreword that he considers private detective fiction and noir fiction to have “mutually exclusive philosophical premises.” Not every noir fan will agree with that premise. No doubt that was the argument for excluding such greats as Dashiell Hammett, the father of hardboiled noir, as well as Raymond Chandler, the king of gunshots in dark and smoky rooms. 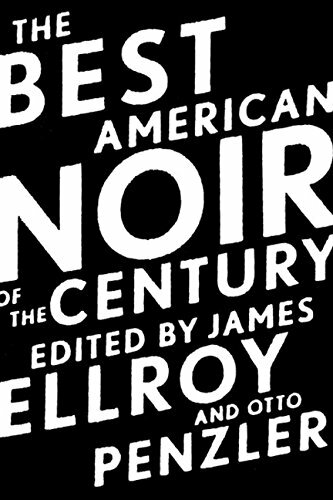 To their credit, however, Penzler and Ellroy have included stories and writers not normally associated with noir—or at least noir in its purest form. David Morrell’s “The Dripping” is an intense horror story, and the proficient Harlan Ellison gives us the terrifically titled, “Mefisto in Onyx,” a science fiction tale, which, in fact is more a novella than a short story. Most of the 39 tales in this collection appeared originally in magazines and pulps such as Manhunt and Black Mask, but also in the more literary American Mercury, Southern Review, and Omni. This compilation intelligently provides brief bios about each author before delving into their contributions. It is interesting to see how the genre has evolved over the long dark years of noir, and The Best American Noir of the Century acts as a de facto stepping-stone in explaining its evolution. Spoilt for choice is an understatement when trying to pick a favorite story from all the gems on offer. The selection is uniformly impressive. Brendan DuBois’ brilliant “A Ticket Out,” James W. Hall’s “Crack,” Stephen Greenleaf’s, “Iris,” Evan Hunter’s totally absorbing “The Last Spin,” F. X. Toole (Jerry Boyd) delivers another knockout punch with “Midnight Emissions,” and Ed Gorman’s, “Out There in the Darkness”—all top my own list for originality and terrific writing. But each reader will have their own and for entirely different reasons. These are gritty, dark stories with leading characters full of flaws with little redemption waiting for them in their future. Everything about The Best American Noir of the Century oozes class, and not just from the authors and editors. The publisher, Houghton Mifflin Harcourt, is to be commended for pulling out all the stops and not skimping on the costs on this edition, giving us a beautifully designed book with a translucent cover. Once the cover is removed, it reveals a classic noir scene of bloody interrogation being noted by an observing scribe. Well worth its impressive weight in gold, it would be a crime not to have this seminal masterpiece in your collection.